We have just released version 1.7.0 of our flagship Magento extension, full page caching solution Evolved Caching. A lot has been added since version 1.6.0 including making both the extension and Varnish integration fully compatible with Magento CE 1.8+, adding the ability to fully manage your Varnish cache from within Magento, allowing URL parameters to be ignored by the cache, and when using AJAX based dynamic content updating you can now define holding HTML to be displayed before the dynamic content has been collected from the server. You may have heard about many full page caching solutions, including Varnish, running into problems with the frontend form key which has been introduced with Magento CE 1.8. The addition of this key if not fixed effectively breaks the store as you can no longer add products to the cart. Some caching solutions which have 'fixed' the problem resolve it by stripping out the extra level of security offered the inclusion of this form key. Evolved Caching resolves the issue both in it's own cache, and in Varnish whilst maintaining the extra security offered by the form key. Another important addition since 1.6.0 is the ability to ignore URL parameters when building the cache. You may for instance have a number of landing pages on your site where you use tracking parameters in the URL to analyse traffic. As these parameters have no bearing on how the page is built, ignoring them means that extra cached content is not created due to their inclusion. A couple of exciting new additions relate to Varnish integration, and holding HTML. You can now actively manage your Varnish cache from within admin, and it will be automatically cleared and warmed at the same time as the Evolved Caching entries. This also extends to managing image, CSS and JS content cached by Varnish. This makes Evolved Caching the most capable Varnish cache integrated solution available for Magento CE 1.8 and above. 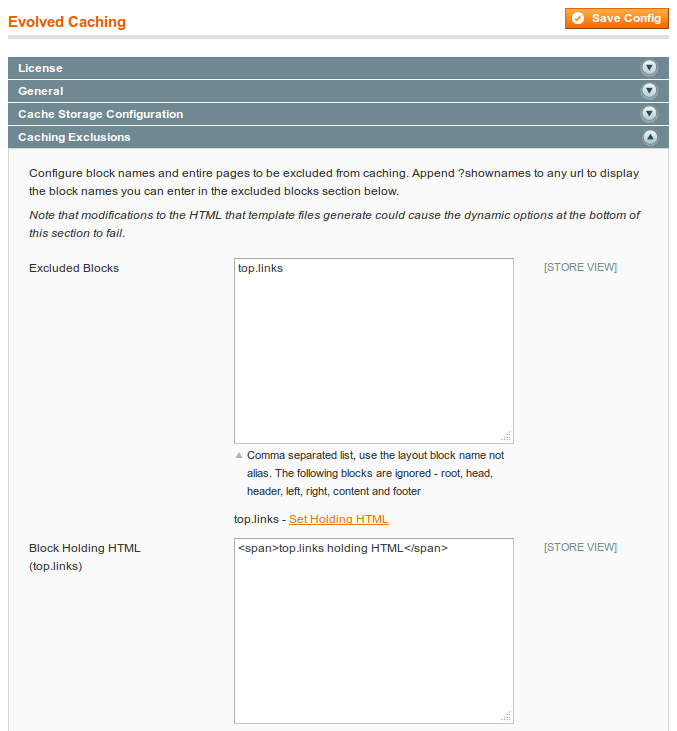 Finally, another major addition is the ability to define holding HTML for excluded blocks. This allows you to set HTML to be displayed on screen while the dynamic block content is being collected from the server via AJAX. Great if you want default content to be displayed as soon as the page loads.